EASYARC® 6013 can be used for the welding of mild steel. Especially suitable for sheet metal welding, tack welding and other types of welding which require a smooth and clean bead appearance. 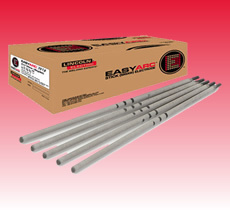 EASYARC® 6013 is an all-position (excluding vertical down), rutile electrode for mild steel. It welds on AC or DC with excellent performance and easy restrike features. 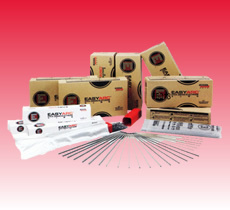 EASYARC® 7018 is a multi-purpose electrode with excellent operator appeal. EASYARC® 7018 is excellent for welding of mild and low alloy steel, which is used for bridges, buildings, ship building, pressure vessels, etc. EASYARC® 7018 can also be used for the construction or repair of earth moving, farm and mining equipment. EASYARC® 7018 is an iron powder low-hydrogen type electrode for all-position welding of mild and low alloy steels. The easily controlled arc of EASYARC® 7018 makes it easy to use on DC & AC polarity. EASYARC® 7018 offers excellent mechanical properties, high efficiency and high impact values at -30°C. It is also easy to strike and restrike.